I love the polish color they gave me at the Beauty and Butter Megamall when I visited for an organic foot spa. They painted my nails with SpaRitual's I Feel The Earth Move. It's a deep maroon lacquer that complemented my skintone. Took a picture of my nails before removing the SpaRitual polish. Not too shabby! But since it has been a force of habit to take off polishes after 4-6 days, I had to tearfully say goodbye. 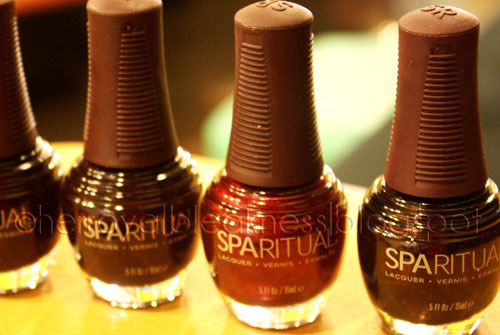 RIP SpaRitual polish 3.2.12. In conclusion, the SpaRitual pedicure I got from Beauty and Butter Megamall stood the test of stress and time. Now, I want my own bottle... of my first ever strong poilsh! Full Disclosure: The organic spa experience was an invitation from Beauty and Butter and did not cost me anything, well except for tipping the exceptional pedicurist. Despite the free spa, you can expect that all opinions expressed in this post are unbiased and reflects my true experience with the salon's product and service. I went to Beauty and Butter Mega last week when I saw your post on it. I agree how pretty the interior is! And cozy pa.
haven't visited them yet! :) hahah! nakakatawa jun pad kung pad picture. you should see my foot. :p it's really ugly LOL! Glad you loved the salon's feel. you live too far! When you visit Manila, go try them! They have affordable services and money-saving deals! that's why it was a little hard for me to "let it go"... hehe.